I'm currently updating my History of the Fed chart. As a side project, here's what's happened to the various Federal Reserve credit programs initiated during the crisis. Most of them have rolled off the Fed's balance sheet. Even the most toxic of them - Maiden Lane I and III - seem set to be paid off. Go to scribd to see a higher resolution pdf. Alternatively, my public gallery has a high-res GIF. This chart illustrates one role of a central bank, that of lender of last resort role. A central banking facing a crisis is supposed to lend to everyone on any sort of collateral and buy all sorts of assets. If you read through the fine print of the chart, you'll see that the Fed's new facilities accepted a broad range of assets - from commercial paper to CDOs to RMBS, and opened themselves up to a fairly wide array of counterparties. What is really happening here is that the Fed is providing liquidity insurance. Liquidity insurance is like any other form of insurance - home insurance, car insurance, credit default insurance, whatever. Given the possibility of a fire, people buy house insurance to compensate for that outcome. Given the possibility that one might be required to do a fire-sale into a thin market, it might be a good idea to purchase liquidity insurance ahead of time. Both are products that can be provided by insurance companies competing in the market. Unfortunately the Fed can never know if it is providing liquidity insurance at the right price because it is the monopoly provider and has no competition. During the credit crisis, a lot of firms were extended liquidity insurance by the Fed even though they never paid for it ahead of time. In the future, one would hope that the free market takes over the Fed's role of liquidity insurance provider, leaving the Fed to operate the clearing system and set a few interest rates. The Social Contrivance of Money... a bit contrived? The title of this post comes from this Paul Samuelson paper. Paul Krugman mentioned the paper last week, as did a few others, including Bob Murphy and Garett Jones. Nick Rowe has brought it up a few times (here for instance). So I trudged through it. Here are a few quick thoughts. The setup goes something like this. Samuelson comes up with a science fiction world in which there's a young generation and an old generation. There are no durable goods. So if the current generation can't save, how can it prepare for a retirement in which it can hardly produce anything? Retirement will be "brutish". On the other hand, what if they print "oblongs of paper" and "officially through the state, or unofficially through custom, make a grand consensus on the use of these greenbacks as a money of exchange." Then the current generation will be able to acquire some of these paper bits and exchange them in their old age to the young for consumption. The world is now a better place, thanks to the social contrivance of fiat money. [Note: by fiat, I mean intrinsically useless and valueless]. This is an interesting model. But just because the model says that the social contrivance of fiat money is an optimal solution doesn't mean that modern central bank money, which by all means appears to be like the fiat money in Samuelson's model, is likewise a social contrivance. Samuelson never addresses the incredible degree of inter-generational coordination that would be required to arrive at a social contrivance that dictates that useless objects must be accepted. Why would future generations accept bits of paper if they don't know from the start that the next generation won't laugh at it? Think of the incredible amount of government resources that would be required to enforce the "grand consensus" or, absent force, the quantity of storytelling that would be necessary to instill the customs necessary for fiat to always be accepted. Samuelson's "social contrivance" is in many ways similar to the idea of a Walrasian auctioneer. Both mechanisms do herculean amounts of work. But outside of an overlapping generations model, this work would be tremendously costly. Now I don't doubt that we could arrive at a social contrivance of fiat money if we really put the resources into it, but why bother? If we want items that are capable of storing wealth over time, we can skimp on the tremendous effort of running a fiat scheme by using things that already have some intrinsic value. A modern central bank that issues well-backed credit will do, as will commodities like gold. The intrinsic value of a commodity or credit item will adequately secure the confidence of the various generations that any exchange they participate in will be fair and quid pro quo. Intrinsic value thereby performs the same function as Samuelson's social contrivance… but at far less cost. The other thing I noticed about Samuelson's model is that he misappropriates the word "money". Money is commonly considered to be a highly liquid object, but in Samuelson's model his green bits of paper only get passed off once every generation. For the rest of time they are simply held. The bits of paper that restore his science fiction world to health could equally be called guano, social security, or whatever. In short, his model explains the possibility of fiat stores of value, but not fiat means-of-exchange. So to sum up, using Samuelson's model of fiat money in order to explain modern central bank money doesn't follow. Social contrivances are expensive. Far easier to secure each generations' trust and participation by setting up a central bank that issues intrinsically valuable and well-backed notes and deposits. A central bank therefore spares society from spending the mass quantity of resources that a socially contrived fiat item would require. Modern central bank liabilities may look like the socially-contrived green bits of paper in Samuelson's paper, but they aren't. Tyler Cowen and Scott Sumner discuss the idea of abolishing central bank-issued cash. The existence of cash can create problems for monetary policy. Say a central bank wants to reduce the rate it pays on central bank deposits to below zero. If it did so, everyone would immediately convert deposits into cash, since owning 0% yielding paper notes is better than owning an instrument that pays a penalty rate. There appears to be a zero-lower bound to the interest rate on deposits. Ban cash and you might remove that bound. Tyler points out that the alternative to an outright ban is to put a Silvio Gesell-style tax on cash that brings a bank note's yield to something below 0%. This way, no one will prefer cash to negative yielding deposits. But as he points out, this is slightly "goofy" since it requires serial numbers and scans on all paper notes. There is a simple alternative that doesn't require a ban, nor does it require that all cash carry sensors, serial numbers, or whatnot. Instead, the central bank can reduce the convenience of cash by constricting the denominations of currency it issues. The Federal Reserve currently prints notes in denominations of $1, $5, $10, $20, $50 and $100. Say that the Fed reduces the rate it pays on deposits to -2%. Households, small businesses, large corporations, and banks flock to turn in all their deposits for bills. The kicker is, the Fed will only provide them with cash in $5s. This imposes a real burden on people because it is more expensive to hold $5s than it is $100s. Banks keep their cash in vaults, but these vaults have been designed to store thousands of $100s, not hundreds of thousands of $5s. Given this inconvenience, deposit holders will be less willing to flee -2% interest rates by moving to cash. Gone is the zero-lower bound problem. I pointed out here that one problem with this policy is that the entire cash-using sector, particular criminals, might Euroize. Rather than hold, say, thirty US$5 bills, or US$150 in -2% deposits people might choose to hold one €100 bill. This decline in the dollar's "brand" would in turn hurt seignorage earned by the Fed. In any case, the core issue here is how to reduce the attractiveness of central bank liabilities in a world in which central banks issue two types - cash and deposits. Reducing interest rates on deposits below 0% works only as long as you simultaneously hurt the convenience of cash by doing something like only issuing $5s (or putting a Gesell tax on cash). Alternatively,one can reduce the attractiveness of both notes and deposits in one fell swoop by doing what Scott Sumner advocates: promise to reduce the future purchasing power of all central bank liabilities. I'm on the fence about policy implications of all of this. I'm a macroeconomic agnostic, for the time being at least. But I think the zero-low bound problem is probably an over-exaggerated problem. Updates: Bill Woolsey has an excellent post on this debate. 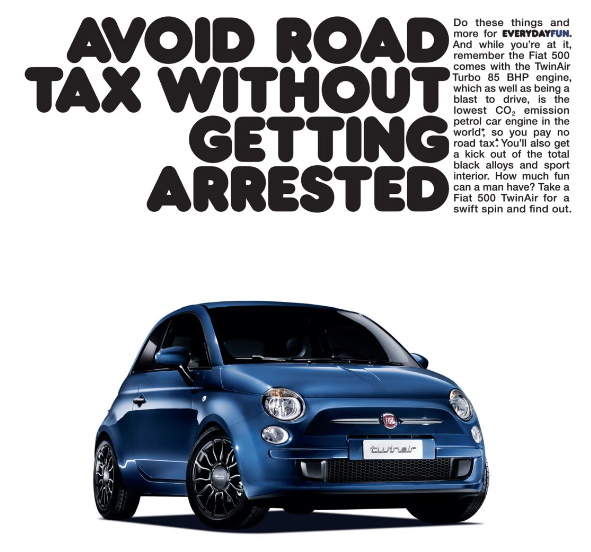 Other things that can be done to avoid the zero-lower bound apart from taxing or banning cash include ceasing redemptions of deposits for cash. Banks can threaten holders of cash to deposit it now or deposit it later at a discount. Bill also notes that if the quality of bank notes is reduced by making them junior claims on bank assets, then senior claims like deposits can easily yield negative amounts without causing a rush to cash. 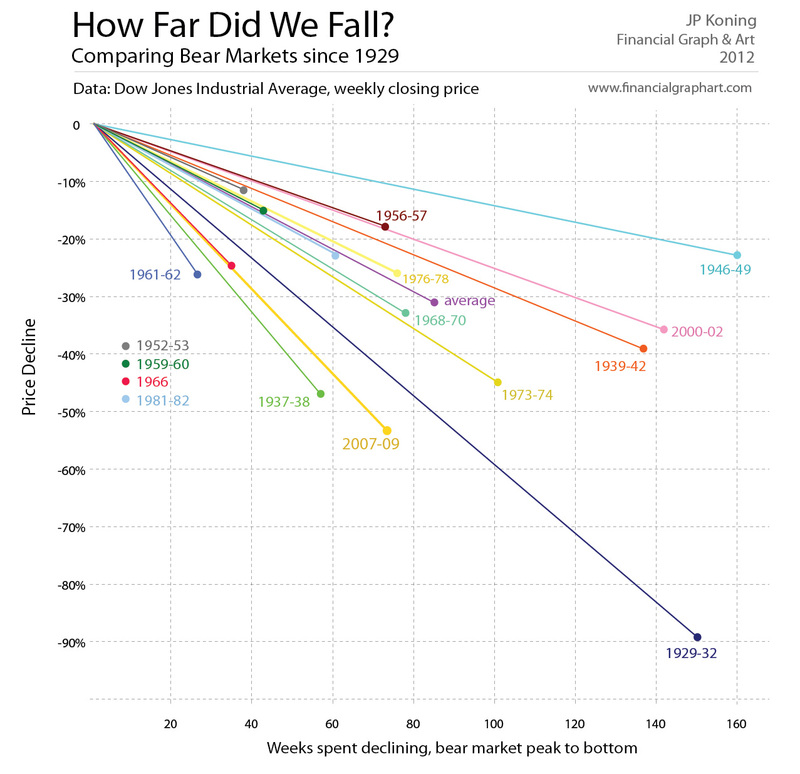 Barry Ritholtz at The Big Picture spotlighted my most recent chart, "The size of major bull markets." You can purchase it on paper format here. While the improvement in GDP and employment since 2009 has been tepid, you can't complain about the stock market's performance. That being said, the current rally pales in comparison to the speed and vigor of the 1933-37 rally. Thoughts? Comments? What would destroying a central bank's assets do? Let recap the debate first before turning to Gavyn's post. Noah Smith pointed out that since fiat money is fundamentally worth nothing (its future value = 0), then all financial assets are worth zero. Financial assets, after all, are mere promises to receive fiat money. Now back up a second. As I pointed out here, modern central bank money is not fundamentally worthless. Were it to fall to a small discount to its fundamental value, Warren Buffet would buy every bit of money up. Central bank money has a fundamental value because even if it can no longer be passed off to shopkeepers, there are assets in the central bank's kitty. Modern central bank money provides a conditional claim on those assets. David Andolfatto and Stephen Williamson also note the importance of central bank assets. I got this idea from Mike Sproul. Back in the day, Mike used to start huge comment wars on the Mises blog when he brought up the topic of central bank assets "backing" its liabilities. In fact, here's the post where I first ran into Mike talking about this interesting feature of central bank money. Geez, I sound pretty ornery. Nick Rowe also brings up central bank assets in his contribution. It's a rendition of his old classic, From gold standard to CPI standard (which I commented on here). In his new post, Nick explains how a modern central bank holds hypothetical CPI baskets in its basement, promising to redeem the liabilities it issues with those CPI baskets at a declining rate 2% every year. Bill Woolsey gives a similiar story to Nick's in this comment on David Glasner's blog. Bill's point is that if a central bank provides a credible commitment to repurchase and cancel its liabilities should the demand for them evaporate, then central bank money will have value. As he points out, this commitment is only credible as long as the central bank holds (or can get a hold of) the necessary assets to commit to those buy backs. The point of all this is that central bank assets are important. They are the key for understanding why modern central bank money is different from pure fiat money, why central bank money's future value > 0, and why financial assets (like corporate bonds) that pay out central bank money are not fundamentally worthless. Which brings us back to Gavyn's post. Gavyn describes a radical idea to reduce UK sovereign debt whereby the Bank of England, the nation's central bank, would cancel part of the government bonds that they've acquired via quantitative easing. By canceling debt held at the BoE, the government's debt-to-GDP ratio comes down. No one in the private sector loses out, since they don't hold any of the canceled debt. The central bank loses out but its loss is counterbalanced by the government's gain such that if you aggregate both under the title "public sector", nothing has happened. Let's look at this with our previous discussion in mind. With less assets on the BoE's balance sheet, the fundamental value of BoE money would have deteriorated. Why? Should the monetary demand for pounds disappear so that all that remains is fundamental value, the BoE will have fewer assets remaining to commit to repurchases so as to prop up the value of the pound. Now, it could be that the debt cancellation really means that a formal debt on the asset side of the central bank's books has been replaced by an implicit promise that the government will come to the aid of the central bank during a run on a central bank's liabilities. In that case, holders of BoE money will quickly realize that there is an unwritten and unrecognized asset on the central bank's balance sheet. As a result, the fundamental value ascribed to the central bank liabilities would be damaged somewhat less than a scenario in which the debt was canceled outright. But damaged they would be since implicit guarantees are not as good as real assets. One reason to make a central bank independent is to cordon off a fixed set of assets that can be used to provide a permanent basis for the fundamental value of central bank money. In this respect, a central bank is like a special purpose vehicle. SPVs are subsidiaries to which a parent company has transferred specific assets. The vehicle has been structured to prevent the parent from tampering with the assets after the fact. The SPV issues its own liabilities to other investors using these ring-fenced assets as backing. A central bank, much like an SPV, has been hived off from its parent, the government, and as a result the holders of its liabilities, the public, can be sure that they have claim to a secure set of assets. If an SPV suddenly had its assets removed by its parent with no guarantee of replacement, the liabilities issued by that SPV would suffer. Same with the liabilities of a central bank. Gavyn worries that the destruction of central bank assets would unleash inflation. He also points out that there are people who are worried about deflation, and they would welcome a destruction of central bank assets. Whichever way you stand, the point here is that central bank money has a fundamental value. The proof of this would be what Gavyn describes: a scenario in which the value of central bank money declines as central bank assets are destroyed. Update: Britmouse and Nick Rowe have blog posts on these issues too. Would Warren Buffett buy green pieces of paper? Noah Smith has an interesting post in which he asks: "Is money fundamentally worth nothing more than the paper it's printed on?" He goes into some soul searching on the definition of "fundamental." His concern with definitions is helpful. The recent debt super-debate was largely blown out proportion due to definitional differences, in my opinion. If anyone is worthy of describing the word fundamental, it's the sage of Omaha. In deciding whether to purchase a stock or not, Warren Buffett conceptualizes the problem by imagining that he'll never be able to sell it again. He's stuck with it forever. If you abstract from an asset's ability to be exchanged onwards, what you're left with is pure fundamental value. This applies to commodities and consumer goods as well as it does to financial assets. The definition of fundamental having been dealt with, we're left with a thorny problem. The word money is still undefined. As Neil Wallace pointed out, "monetary theories should not contain an undefined object labeled money." Is Noah talking about gold, cattle, gold-backed bank notes, bitcoin, yap stones, Federal Reserve notes? In nomadic societies, cattle were highly liquid. What was a cow's fundamental value? 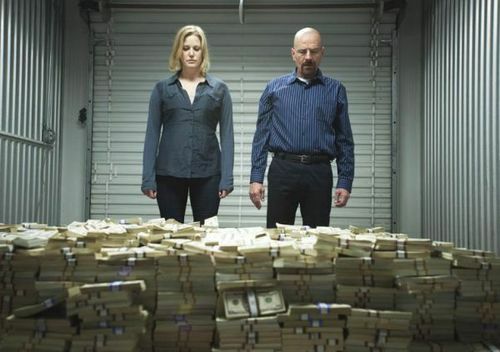 Assume that it could never be exchanged again. What remains is the cow's fundamental value — it might be eaten, it could be used to make clothing, it can help rear more cows, it can help in the fields etc. Take another form of "money". In the 1800s, most bank notes were issued with gold redemption clauses. What was a gold-backed bank note's fundamental value? Assume that a note can never be exchanged onwards, and you're left with a security with some fine print on it that says that the issuing bank will redeem it for gold. 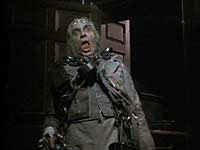 Its fundamental value is the value of the underlying metal. I'm going to assume that by green pieces of paper, Noah is specifically interested in the fundamental value of fiat money, perhaps Federal Reserve notes. Assume that a specific FR note, say the one in your wallet, can never be exchanged onwards. What is it worth? This isn't an economic question. It's a question of security analysis. What does the fine print of your FR Note say? FR notes are liabilities of the Federal Reserve. They carry a "first and paramount lien" on the assets of the Federal Reserve. Having a first lien means that an FR note holder ranks higher than all other Federal Reserve creditors. In other words, your note is an excellent claim. What are the Fed's assets? They have a bunch of government bonds, some gold,* and a few foreign currency denominated assets. These assets aren't paid out on demand. Rather, as a note holder you'd have to wait for the Federal Reserve to be wound up before you could get their hands on these assets. So the fundamental value of an non-exchangeable FR note is the distant possibility that the note holder gets to exercise their senior claim on underlying Federal Reserve assets. That possibility is worth some non-zero value. This all reminds me of an old conversation I had with Nick Rowe. See here. In that conversation, Nick uses the same Buffetian concept of fundamental value as I use in this post, and argues that fiat money has no fundamental value. I argue the opposite. Ok, that's my answer to Noah's question. An interesting thought game is to consider what would happen if all FR notes are no longer exchangable. Say that for some reason or other, no one will accept notes anymore. The price of FR notes would immediately plunge towards their fundamental value. But a large component of a note's fundamental value is derived from the underlying value of the bonds which the Fed holds on its balance sheet. Because these bonds promise to pay a fixed quantity of dollars, the bonds themselves would simultaneously plunge in value along with the notes. And as the bonds plunge in value, the notes do too. And as the notes fall in value, the bonds plunge again etc. etc. until they both spiral to zero. What halts this spiral is that the Fed holds more than just nominal bonds. It also owns some US dollar assets that pay an inflation-linked return, namely Treasury Inflations Protected notes. At the same time they hold gold. Lastly, they hold foreign denominated bonds whose value would be protected. At some much lower price for FR notes, the Warren Buffetts of the world calculate that the value of a note's senior claim on gold, TIPS, and forex is probably worth more than the market price of notes, and they step in to buy. The death spiral ends. *the Fed doesn't actually own gold. It owns claims to gold. See this article. 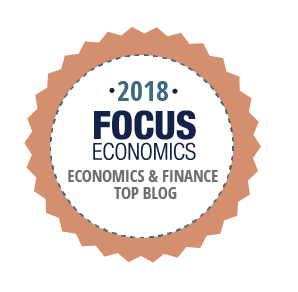 Garett Jones did a podcast on Irving Fisher at Econtalk last week. He talked about the Great Depression and Fisher's debt deflation theory. Jonathan Catalan and Daniel Kuehn also discuss the podcast. Jones focuses on Fisher's 1933 paper The Debt Deflation Theory of Great Depressions. Those who imagine that Roosevelt's avowed reflation is not the cause of our recovery but that we had "reached the bottom anyway" are very much mistaken. At any rate, they have given no evidence, so far as I have seen, that we had reached the bottom. And if they are right, my analysis must be woefully wrong. According to all the evidence, under that analysis, debt and deflation, which had wrought havoc up to March 4, 1933, were then stronger than ever and, if let alone, would have wreaked greater wreckage than ever, after March 4. Had no "artificial respiration" been applied, we would soon have seen general bankruptcies of the mortgage guarantee companies, savings banks, life insurance companies, railways, municipalities, and states. It's worth overlaying Fisher's words with the charts of the Great Depression I posted here. If reflation can now so easily and quickly reverse the deadly down-swing of deflation after nearly four years, when it was gathering increased momentum, it would have been still easier, and at any time, to have stopped it earlier. In fact, under President Hoover, recovery was apparently well started by the Federal Reserve open-market purchases, which revived prices and business from May to September 1932. The efforts were not kept up and recovery was stopped by various circumstances, including the political "campaign of fear." It would have been still easier to have prevented the depression almost altogether. In fact, in my opinion, this would have been done had Governor Strong of the Federal Reserve Bank of New York lived, or had his policies been embraced by other banks and the Federal Reserve Board and pursued consistently after his death. 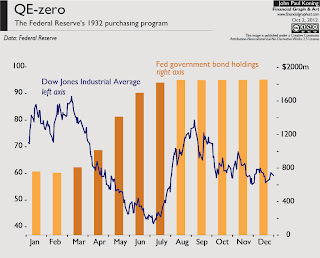 The May to September 1932 open market purchases was the first real quantitative easing, or QE-zero. You can read about their ineffectiveness in this post. Fisher says the recovery was well-started from May to September, but the data doesn't show that. In the name of monetary experimentation I bought some bitcoins a while back and have been watching them fluctuate in value. Bitcoin is a digital form of exchange created back in 2009 that has since grown to considerable proportions. One bitcoin is worth around $11 these days, up from a fraction of a penny just two years ago. With around 10.2 million coins outstanding, the entire value of bitcoin stands at around $120m. That's small fry compared to $1 trillion paper US dollars in circulation, or the $5 trillion or so worth of gold, yet it's big enough to deserve attention. Bitcoin creates problems for two theories that attempt to explain why a new fiat money might gain traction and continue to have value - the Regression Theorem and chartal theory of money. In order to delve into these two theories, here's some data on the debut of bitcoin as a currency that should help out. Back in March 2010, someone tried to offer bitcoin for pizza in but never managed to get a bid. Later in May a bitcoin user named Laszlo finally managed to trade 10,000 BTC for a pizza. Given that the pizza was worth $40, this valued bitcoin at around a half-a-cent each. But even before the famous pizza exchange there were trades going at the Bitcoin Market, a formal bitcoin exchanges. The first published trade from late April involved 1000 coins at 0.003, a princely sum of $3. Back in October 2009 New Liberty Standard began publishing an exchange rate based off the electricity cost of generating bitcoin, though there is no indication of how much trade was actually done. The thinking behind Ludwig von Mises's regression theorem is that people's expectations "regress" into the past. An intrinsically worthless fiat token (like US dollars or bitcoin) trades at a positive value because it had a positive value yesterday, and it had a positive value yesterday because it did the day before. This regression continues until day 1 of the fiat money's debut. What on day 1 might have generated the positive value necessary to initiate this chain of cause and effect? Mises's answer: the token wasn't a money on day 1, it was already being traded for its non-monetary value. This initial positive value provides the seed that eventually leads to the phenomenon of fiat money. Along the way the money could lose its non-monetary use -- a gold linked currency could be decoupled from gold -- but it will continue to have a positive value. Bitcoin challenges Mises's Regression theorem because bitcoin never had an initial non-monetary use. They are just bytes. You can't eat them, wear them, or decorate with them. There are three ways you can proceed with this. 1. Actually, bitcoin did have an initial non-monetary use so the regression theorem still applies. In its initial form bitcoin was valued as a sign of geekiness, a demonstration of one's devotion to technology. Based on this initial non-monetary value, a Misesian progression could proceed. This explains why seemingly valueless bitcoin was eventually accepted in payment for a pizza and why it continues to be valued as money today. 2. No, Bitcoin never had a non-monetary use. It's intrinsically worthless. It's a ponzi scheme. In the short term, people can irrationally bid up the price to some non-zero amount. But in the long term the logic of the regression theorem requires that the price of Bitcoin fall to zero. 3. The regression theorem is wrong. The second theory that Bitcoin challenges is the chartal theory of Georg Frederich Knapp. The chartal theory of money says that a fiat money gains value because a government places an obligation on its subjects (say a tax) that can only be discharged by payment of those fiat tokens. This generates a demand for the tokens so that they trade at a positive value in the market. The obvious challenge to this theory is that bitcoin has emerged spontaneously. No government asks that its taxes or bonds be paid in bitcoin. Yet bitcoin is a positively valued money token. You can go a few ways with this. 1. Bitcoin isn't money, it's purely anomalous. The chartal theory doesn't have to explain it. Bitcoin will fall to zero. 3. The chartal theory of money can describe a few types of fiat money, and some monetary phenomena, but shouldn't be expected to explain other types of fiat money or phenomena. I think both theories cut the cake in a way that prevents them from seeing from a better vantage point. They treat money as a noun, not an adjective. The problem with treating money as a noun is that it implies that somewhere along the line of its development, bitcoin crossed some invisible line from being a money to a non-money. If you think of money as an adjective, then "moneyness" becomes the lens by which you view the problem. From this perspective, one might say that Bitcoin always was a money. A degree of moneyness was attached to it from the moment the first bitcoin user realized that their bitcoins could traded to another user for something else. Bitcoin's moneyness would have only increased as bitcoin became involved in more and more transactions. If you treat money as an adjective, the regression theorem and chartalist theory are irrelevant. Whether moneyness gets attached to a fiat token issued by the government to discharge taxes, or whether it gets attached to an object valuable for religious or industrial purposes, is unimportant. The degree of liquidity - or moneyness - is the variable of interest. David Glasner had some recent posts (here and here) on Ludwig von Mises and Austrian Business Cycle Theory (ABCT). Bob Murphy pushed back here with a good rebuttal. But David's general point still stands: what necessarily forces a central bank that has adopted the practice of lending at a rate below the natural rate to ever cease this practice? Why does there have to be an inevitable bust? I consider myself an Austrian in that one of my favorite economists is Carl Menger. I've also written a thing or two for the Mises Institute, my most recent being on Menger and Leon Walras and how the two would have differed on the phenomenon of high frequency trading. On the other hand, when it comes to macroeconomics, I remain a business cycle agnostic. I'm willing to be converted though. All you've got to do is answer a few questions of mine. Say a central bank decides to reduce the rate at which it lends below the natural rate. Businesses can come to it for cheap loans -- and they do. Mises points out that as long as this differential exists it'll eventually lead to a "crack-up boom". The currency enters hyperinflation stage and, at its peak, people either turn to barter or dollarization occurs. Alarmed at this prospect, the central bank will probably increase rates in order to stave off the crack up. But say the central bank and the currency users exists on a small island far from everywhere so dollarization can't happen. Say also that the police force is vigilant about preventing people from bartering. As a result, the currency issued by the central bank continues to be used, even during hyperinflation. The inevitable flight from money — the crack-up boom — can't occur. The currency perpetually falls. So having assumed the crack-up boom away, why should the setting of market rates below the natural rate inevitably end in a bust? Sure, in the interim there might be a redirection of capital towards projects that are only profitable at low rates. In this context, a sudden increase in rates by the central bank back up to the natural rate might show some of these projects to be unprofitable. You've got a bust of sorts. But our central bank, released from the disciplining threat of a crack-up boom, steadfastly refuses to raise rates. So if rates can be kept perpetually too low, and a crack-up boom can be averted, what causes the bust? To start off, one explanation for a bust occurring is that when rates are kept too low, excess resources are allocated to interest-sensitive distant projects and not enough to less interest-sensitive near-term projects. At some point there's a realization that not enough capital has been allocated to present needs and all those future projects suddenly collapse in value. Thus a bust. What causes this sudden epiphany? As David Glasner asks, are workers dying of starvation? It can't be higher interest rates that render these projects unprofitable since, as I've already pointed out, the central bank keeps rates permanently low. Even if capital begins to flow into projects that are only profitable at low rates, wouldn't the prices of materials required by those projects be bid up relative to other prices, thereby putting a quick end to the profitability of these distant projects? Wouldn't the relative prices of material required for near term projects fall, thereby increasing the profitability of near term projects? How can any significant capital misallocation proceed given these rapid relative price adjustments? If you can answer all my questions, then you'll have successfully converted me. I've been having fun with the visually-striking infograph Profitable Colours. Go here. It classifies company logos by colour, then ranks them according to worth, stock performance, and sorts them into industries. Finance companies tend to be blue while consumer goods logos tend to be red. I wonder why. Do credit-induced asset price bubbles show up in GDP? But in seeking to free monetary theory and policy from the Keynesian overemphasis on interest rates, the Market Monetarists tend to downplay the extent to which central banks can cause or aggravate unsustainable asset price movements by means of policies that drive interest rates away from their "natural" values. Such distortions can be significant even when they don’t involve exceptionally rapid growth in nominal income, because measures of nominal income, including nominal GDP, do not measure financial activity or activity at early stages of production. George is saying that nominal GDP might not properly capture the effects of a central bank setting its rates below the natural rate because it doesn't measure a few key variables, namely financial activity and early-stage investment projects. This sounds somewhat like a rechristening of the classic Austrian complaint against traditional measures of inflation. Here, for instance, is an article by Bob Murphy talking about how relatively tepid changes in CPI might mask credit-induced asset bubbles. As I pointed out in my comment on George's blog, GDP calculations include investment, presumably much of which is in the early stages of production. GDP also includes inventories. Bill Woolsey describes this better than I can. As for changes in financial activity due to excess credit, I think GDP should capture it pretty quickly. The next little bit is just a paraphrasing of Fritz Machlup's The Stock Market, Credit, and Capital (pdf). Machlup wrote it to counter claims that the stock market was capable of "tying up capital". It's a great read. Another factor limiting the ability of long chains of stock transaction to tie up capital is that the longer the chain continues, the more likely stock prices are to be bid up. At higher prices, firms are more willing to finance themselves by issuing new shares since their cost of capital has fallen. This is because they can raise more today than the day before while issuing the same amount of shares. When firms issue new shares they drain the purchasing power originally created by excess credit creation out of the market and invest it in new capital. This allows GDP to ultimately capture the effect. So a decline in market rates below the natural rate will result in more credit, and this credit could very well be used to purchase stocks, and this will put upward pressure on prices. 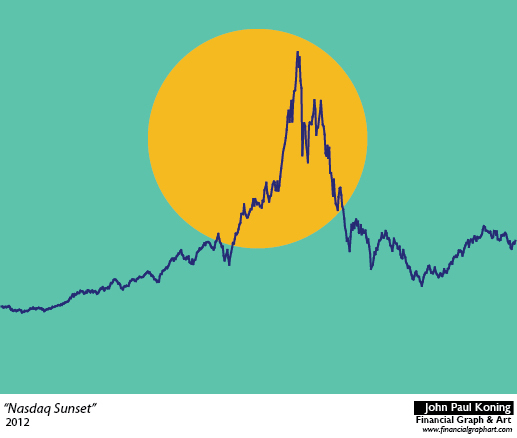 But just as quickly as credit is used to buy stocks, purchasing power is released from the stock market as the sellers of stocks use the proceeds to buy real goods. GDP measures will capture the effect. I think this process happens fairly quickly given the agileness of financial markets. Maybe George thinks these chains can persist for some time. It would seem then that market monetarists like Nick Rowe and Selgin do have some things in common. *There is a third thing that can be done with the cash. It can be held. But if people do this, then the issuing bank never issued excess credit in the first place. Sufficient demand already existed in the economy for bank liquidity and this is expressed by the fact that people willingly decide to hold those newly created deposits. People often have difficulties wrapping their head around the idea of selling a stock short. It seems odd. Once people understand how it works, they also tend to perceive short-selling as immoral. They also assume that only a few malcontents engage in that sort of transaction. But everyone either has been, is, or will be a short-seller. When you short a stock, you're basically borrowing a stock and immediately selling it in the market. When the lender of the stock demands the stock back, as the short seller you've got to buy the stock back in the open market and deliver it to the lender. Now consider someone who borrows from the bank. You borrow a deposit and immediately sell it in the market. When the bank demands the deposit back, as the borrower you have to buy the deposit back in the open market and deliver it to the bank. These two transactions are the same transaction. Borrow an asset, sell it, and when the lender requires delivery, buy it back and deliver it to the lender. Anyone who borrows from a bank is a short-seller. Part of the ethical argument against short selling has been that short sellers are hoping for lower stock prices. The reason short sellers want a stock's price to fall is that it allows them to buy the stock back at a cheaper price and deliver it to the lender of the stock, thereby earning a good profit. Wishing for a lower stock price is presumably the unethical part. It's a form of schadenfreude. But anyone who borrows from a bank wishes for the very much the same thing! When the bank calls in your loan, you really hope that those deposits have fallen in value. That way you earn a profit. You earn a profit because you don't have to sell as many real resources to repurchase the deposits as you initially bought with the first sale of deposits. There's also schadenfreude involved here. Wouldn't you prefer if the bank had gone belly-up? Or that your nation's central bank had gone hyper-inflationary? Either way, buying back the deposits will be a cinch. So if short selling is only done by vultures, so is borrowing. If the former should be banned, so should the latter. This is an illustration of the interconnectivity of CDO markets from Deus Ex Macchiatto. All of the CDOs in a strongly connected subgraph depend on all of the others. You can’t value any one in isolation: you have to consider all of them together. So… how big do the strongly connected subgraphs get? Financial fragility or robust self organization? He asks this because Nayarana Kocherlakota, head of the Minneapolis Fed, once said, somewhat counter-intuitively, that over the long run, a low fed funds rate must lead to consistent—but low—levels of deflation. This seems odd at first blush because we've been conditioned to assume that low interest rates lead to inflation, not deflation. I'm going to try and give an answer that financial types will understand. The spoiler is... over the short term we'd have inflation, but Kocherlakota is probably right that after some time passes, an artificially low federal funds rate will lead to a steady deflation. Imagine that you're an investor who can hold either deposits at the central bank or units of some durable good. In order for these two assets to be willingly held by both you and your fellow investors, each must provide attractive returns. If one of these assets provides excess returns, arbitrage dictates that you'll all try to switch to that asset until those excess returns cease to exist. A bank deposit's return can be decomposed into an interest component, expected capital appreciation (or depreciation), and a liquidity yield. Liquidity is a special benefit that a deposit provides since it more marketable than most assets. The durable good, assume it costs nothing to store, provides a return in the form of capital appreciation (or depreciation), but no interest and a liquidity yield that is so minimal that it may as well be nothing. At the outset, the returns on the two assets are already equal. But the central bank suddenly lowers the interest component of the return it pays on deposits to nothing, catching the investment community by surprise. As an investor you're distraught. The deposit you held just prior to the announcement yielded, say, 5%, and now it yields just 0%. You'd like to sell it for the durable good, since the return on the durable good (which is composed, say, of expectations of 10% price appreciation) is superior. But investors holding the durable good won't sell to you, simply because the return they require on the 0% deposit must be similar to the return on the durable good they already own. And it isn't. To convince them to accept your 0% deposit for their good, you must increase its return. You can do this by increasing the expected capital appreciation provided by the deposit. By marking down the current price of the deposit relative to its expected future price, you provide your trading partner with the necessary potential capital appreciation. Whoever buys the deposit can be sure that even though it yields an interest rate of 0%, it will provide a commensurate capital return of 5% or so. In knocking down the market price of the deposit, you've caused immediate inflation. The purchasing power of money (the deposit) has fallen such that you can't buy as many durable goods with it as you could before. At the same time, you've cleared the stage for future expectations of deflation. That's because in low-balling the offer price for your deposit to attract buyers, you've increased the expected capital appreciation provided by the deposit. You've caused inflation in order to promise deflation. Maybe the entire process happens immediately. But economists like to divide things into the short and long run. In the short run, all you'll see is inflation as the market gropes for a new and lower clearing price for deposits. At first, perhaps, most investors think that the central bank will only keep rates at 0% for a year and then set them back at their normal rate. But when the next year comes and the bank surprises the market by keeping those rates at zero, once again you'll have to rapidly lower the price of your deposit so as to provide potential deposit buyers with enough capital appreciation to compensate for the disappointing yield on deposits. This yearly pattern of lowering the price you offer on your deposits continues until the market is no longer surprised by the central bank's intentions to keep rates at 0% for eternity. Only then will the inflation end. Deposits, which by now have been bid down to some terminally low level, will slowly and steadily appreciate. This is the "consistent deflation" that Kocherlakota describes. There is one interesting caveat here. I started out the example by pointing out that one component of a deposit's return is its liquidity yield. Because the market puts a premium on liquid assets —a liquidity premium, so to say —deposits and other liquid assets can provide lower interest rates than not-so-liquid assets. But if deposits (or any other money-like object) are constantly plunging in value, they cease to be attractive as medium of exchange. In general, people prefer to transact with relatively stable monies. Thus each time you mark down the deposit's value, its liquidity premium deteriorates as the market searches out for other assets that can serve as better mediums of exchange. With the decline in its liquidity yield, the overall return from holding deposits declines even further. This inferior return can only be compensated by a promise of more capital appreciation ie. yet another fall in today's market price relative to expected future prices. This process feeds on itself as the falling value of a liquid assets renders it less liquid which causes it to fall further in price. At some point, the deposit risks being demonetized. What comes first? Will the deposits reach a terminally low price from which they commense their rise? Or will they become demonetised and valueless? What about the assets that back deposits... might these provide some lower limit for the price of a deposit, even if it pays 0% loses its entire liquidity premium? Fun questions, but I'll leave those for someone else. Karl Smith here and here, and Andy Harless here. "On the monetary policy side, Roosevelt abolished the gold standard and—even more importantly—announced the explicit objective of inflating the price level to pre-Depression levels. On the fiscal policy side, Roosevelt expanded real and deficit spending, which made his policy objective credible." Economists often describe the regime uncertainty created by FDR's policies. Does anyone know of any charts illustrating regime uncertainty between 1930 and 1934? Bob Murphy asked whether Lionel Robbins was right in saying that central bank policy in the late 1920s and early 1930s was a complete reversal of traditional central bank doctrine. A blogger named Lord Keynes, (perhaps the ghost of Keynes? ), takes exception to this idea, noting somewhat dramatically that Murphy is "dead wrong" and "utterly absurd". These sorts of us vs. them dramatics would be best left to the likes of professional sports casters (economic history is not a competition), but I'm going to look past the silly theatrics so as to delve into what is a very interesting issue. The nub of the debate, in my view at least, boils down to the definition of traditional central banking doctrine. My conclusion, which I'll get around to explaining, is that compared to the 1800s, central bank policy between 1929-1932 was probably a complete reversal. But compared to Fed policy through most of the 1920s, the Fed's policy during the Depression was similar. One major categorical difference between 1923 and 1932 was the broad powers provided by the Glass Steagall Act. More on that later. What Robbins is enunciating here is basically the classical advice of Walter Bagehot. In a crisis, central bankers should accept all collateral in return for loans, but should only do so at a penalty rate. (The latter is what Robbins is referring to when he says that a central bank must "keep the rate of discount high"). By penalty rate, Bagehot meant that central bank should only lend at some interest rate above the current market rate. In modern parlance, this is like saying that the central bank must force borrowers to take a haircut on their collateral. A Bagehotian central bank is an extremely passive one. As a pure lender, it must wait for banks to come to it, as opposed to a buying central bank which can initiate transactions on its own behalf. Furthermore, a Bagehotian central bank can't influence banks to borrow at its discount window by lowering its own rate below the market's, since it must lend at a penalty rate. It can drop its rates to some low level, but only after the market has done so. By the early 1920s, due to a combination of factors, some of them political, others technical, the Fed had effectively stopped discounting at a penalty rate. At the same time the Fed had begun to use open market operations in monetary policy, not just discounts. Daniel Kuehn touches on this here. Open market operations were not entirely unknown to Bagehotian central banks. But they were a sideshow to discount window lending. The thinking behind the Fed's unveiling of open market operations can be found in the Fed's 1923 Annual Report, in which the Riefler-Burgess doctrine (a term coined by Meltzer) was first described. The result of all this was that by 1923, the Federal Reserve was no longer Bagehotian. Rather than a passive wallflower that stepped in only rarely, it actively participated at all points in an economy's trajectory. The upshot is that when Lionel Robbins describes the Federal Reserve open market purchases of $410m from October 1929 to December 1930 as breaking with tradition (pg. 73), he is right... since the tradition he is referring to is Bagehot's and not the more recent 1920s Riefler-Burgess tradition. At the same time, Lord Keynes isn't wrong to point out that Fed policy in the Great Depression was similar to Fed policy during the 1920s, insofar as they both relied heavily on open market operations. As Lord Keynes points out in his post, there is certainly a quantitative difference between Fed policy in 1923 and 1932. 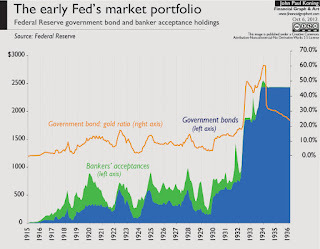 See the chart below of Fed government bond holdings and bankers' acceptances, the former of which shows a terrific spike in 1932. 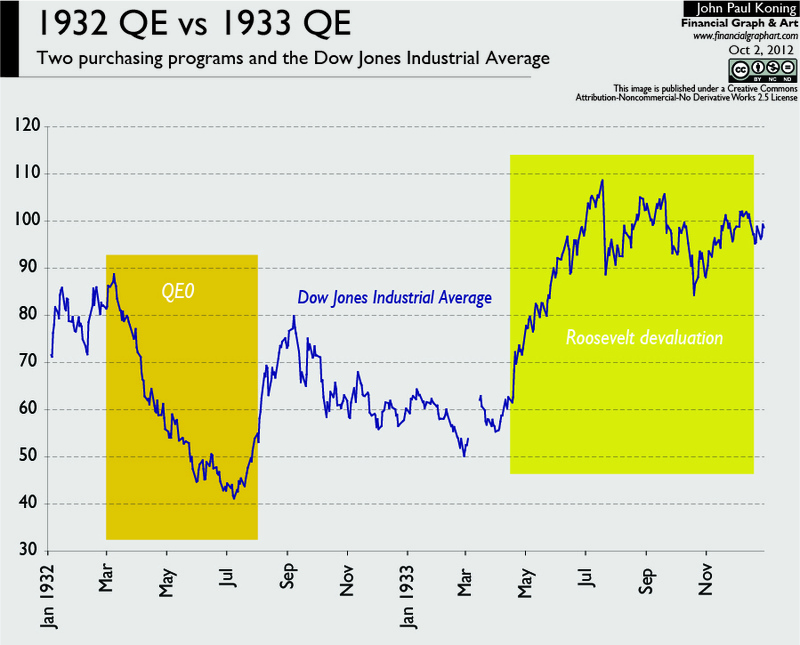 In this post, I called the 1932 event QE0. The Fed was permitted to buy bankers' acceptances in the open market, but usually just set a fixed rate and let sellers come to it. There is an important qualitative difference between 1923 and 1932. The difference is this. Before 1932, all Federal Reserve notes had to be backed 40% by gold and 60% by “eligible paper”. The latter was made up primarily of commercial paper. The passage of the Glass Steagall Act in February 1932 allowed government securities to be eligible, and therefore dramatically increased the ability of the Fed to engage in QE with government debt. Prior to then, the government could only engage in QE with government debt to the extent that it already had excess gold and eligible paper. It was constrained. 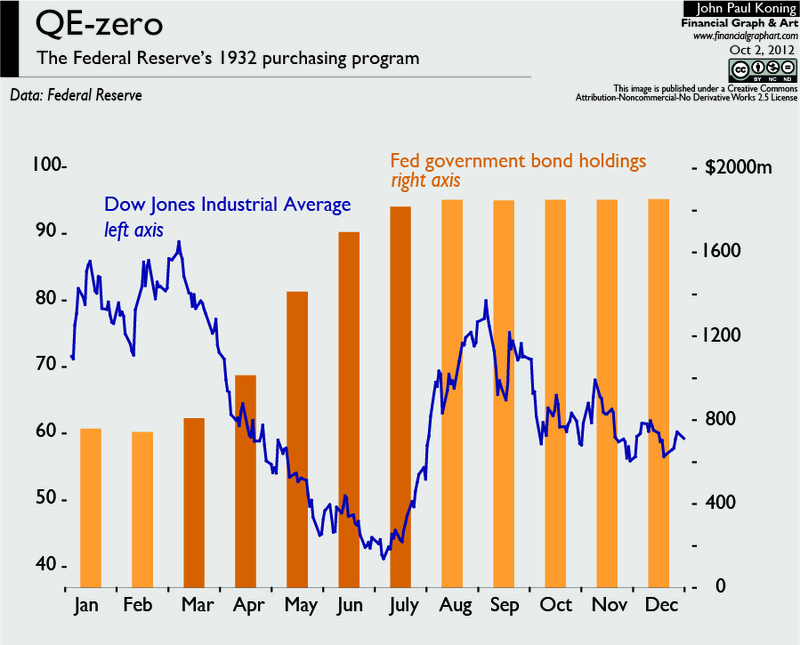 The effects of this constraint, and its removal, is best seen in the chart by the orange line, which shows the Fed's government bond-to-gold ratio. Having never risen above 20%, the passage of Glass Steagall allowed the ratio to rise to 60% in 1934. In a nutshell, the Fed could never have done what it did in 1932 in 1923. Bank of Canada researchers recently published an interesting paper tilted the Evolution of Canada's Global Export Market Share. One's gut reaction is to assume that with the commodities boom of the last decade, Canada's export share would have dramatically risen. We are, after all, hewers of wood and drawers of water, and the stuff we sell is generally more expensive. As the table shows, Canada's share of global exports has steadily declined since 1990 from 4.1% to 2.8%, despite oil prices being some 8x higher than before.. While Canada's energy commodity exports have ballooned, look what has happened to machinery, automotive, and consumer exports since 2001. Splat. The commodity boom's influence on Canada's export share has been entirely counterbalanced by general weakness in Canadian manufacturing exports. Since 2001, Canada has experienced some of the fastest growing costs when it comes to manufacturing. As a result, it's tough to justify building, let alone maintaining, export capacity in Canada's manufacturing regions. If labour and other costs weren't sticky, we wouldn't be seeing this effect. Rather, the nominal rise in the Canadian dollar of the past ten years would be perfectly offset by local wage cuts, ensuring that real costs stayed constant. But we don't live in that world. That's why monetary policy has bite, and why devaluations are effective. Bob Murphy asks if central bank actions taken during the early 1930s might be considered "unprecedented". In the comments I pointed out that during that era an early form of QE was tried. I'm not referring here to the famous 1933 Roosevelt purchases of gold that market monetarists often point to. For instance, see David Glasner here, David Beckworth here, and Scott Sumner here. Scott also has a very interesting paper on the 1933 gold purchasing program (pdf). No, I was referring to the 1932 treasury purchasing program. I'm going to replicate the simple graphical analysis that market monetarists use in order to look at the 1932 episode. See this post by Lars Christensen, for example, who overlays important monetary events (QE1, QE2, LTRO) over the S&P500. Here is the context. Prior to 1932, the Federal Reserve system was significantly limited in its ability to embark on large purchases of government securities. This was because of strict backing laws in the Federal Reserve Act that limited eligible backing assets to gold and assets accepted as collateral for Fed discount loans, primarily commercial paper. 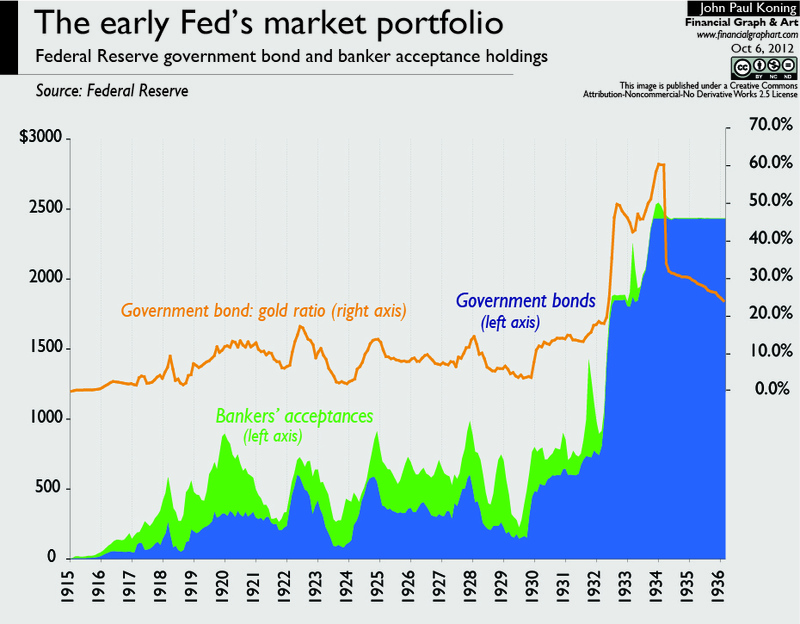 In effect, the Reserve banks could only purchase government debt to the extent that there was already excess gold and discounted assets on the Reserve bank balance sheets. This limitation was removed with the passage of the Glass Steagall Act of February 1932, which allowed the Fed to include government debt as backing for notes and deposits. Almost immediately the Federal Reserve began a large scale asset purchasing program that increased the system's government debt portfolio from $743 million at the end of February 1932 to $1413m by May. The program, which I'll call QE0, continued at a slower rate after May, eventually hitting a peak just above $1800m by the end of July 1932. I overlay this on the Dow Jones Industrial Average. 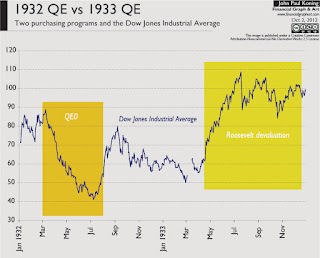 The second chart extends the time frame to include 1933, putting QE0 on a scale with the Roosevelt devaluation. Gavyn Davies, who has treaded this path before, notes that Milton Friedman and Anna Schwartz declared QE0 to be a success. In their Monetary History of the United States, the two drew attention to the conjunction of QE0 with a lull in bank failures and a "tapering off of the in the decline in the stock of money". They point to the bottoming of industrial production in August, five months after QE0 started, as a sign of its success. In his History of the Federal Reserve, Allan Meltzer also strikes a note of optimism when he discusses QE0, noting many of the same improvements in data that Friedman and Schwartz point to. Meltzer writes that "it seems likely that had purchases continued, the collapse of the monetary system during the winter of 1933 might have been avoided" and notes the rise in stock prices beginning in July as evidence. But no market monetarist would agree with Friedman and Schwartz's analysis, since the new breed of monetarists take asset prices as the best indication of monetary stance. Scott Sumner points out here, for instance, that US equity markets had one of their fastest two day rallies in history as President Hoover met with Congressional leaders to begin work on Glass Steagall. All good, then, for the market monetarist stance, who like to see rising market prices coincide with easy monetary policy at the zero lower bound. Unfortunately for them that was the end of the rally. Markets continued falling to new lows even as QE0 accelerated. Scott Sumner indeed notes that "In many respects, the period from April to July 1932 was the worst three months of the entire Depression. Commodity prices continued to fall, and both stock prices and industrial production reached their Depression lows in July." Oddly enough, only with the end of the QE0 did stock prices begin to rise again, as the first chart shows, which runs contra to market monetarist thinking. 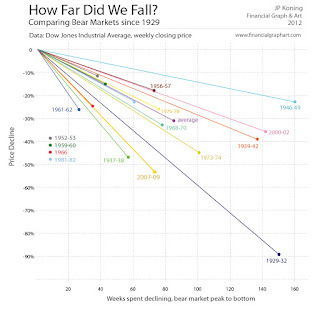 No wonder then that market monetarists prefer to look at the second chart. In 1933, the conjunction of increases in stock prices with various monetary events, including the departure of the dollar from gold convertibility and Roosevelt's gold purchase plan, is quite striking. This cozy relationship is no doubt the main reason that market monetarists prefer to point to 1933 rather than QE0 for evidence of monetary policy effectiveness at the zero lower bound. QE0's seeming failure might seem to confirm Murray Rothbard's view that the huge increase in the money supply engendered by QE0 "endangered public confidence in the government's ability to maintain the dollar on the gold standard," leading to a loss of confidence on the part of foreigners who drew out gold, and on the part of Americans who converted deposits into notes. This turned an intended inflation into an unintended deflation. The aboves is also Peter Temin's view, who points out that the purchases reduced confidence, the resulting gold outflow nullifying QE0's potential for expansion. My reading of Scott Sumner is that the 1932 purchasing program was rendered ineffective because of growing expectations that the dollar would float, leading to gold ouflows and an ensuing general panic in equity markets. In meting out blame for this panic, Sumner emphasizes the role of Congress in engendering uncertainty rather than the Fed's QE0 program. Once the dollar panic was alleviated and the hoarding instinct of foreign central banks and the private sector satiated, markets began their rise in the latter half of 1932. Hsieh and Romer (pdf), on the other hand, use data on dollar forward rates to show that traders were not particularly worried about a dollar devaluation. If H&R are right, then one can only conclude that there was no dollar crisis, leaving market monetarists with no corresponding event to blame for counterbalancing the inflationary effects of QE0. So QE0, it would seem, was irrelevant -- a non-event. Scott talks about Hsieh and Romer's paper here. It all seems rather tortured to me, and leads me to (somewhat dismally) conclude that one can probably get a set of historical events to say almost anything one wants it to say. This is not a criticism of Scott, but one of economics in general. There is the possibility, for the reasons discussed above, that, after the rate of interest has fallen to a certain level, liquidity-preference may become virtually absolute in the sense that almost everyone prefers cash to holding a debt which yields so low a rate of interest. In this event the monetary authority would have lost effective control over the rate of interest. But whilst this limiting case might become practically important in future, I know of no example of it hitherto. Indeed, owing to the unwillingness of most monetary authorities to deal boldly in debts of long term, there has not been much opportunity for a test. Moreover, if such a situation were to arise, it would mean that the public authority itself could borrow through the banking system on an unlimited scale at a nominal rate of interest. The most striking examples of a complete breakdown of stability in the rate of interest, due to the liquidity function flattening out in one direction or the other, have occurred in very abnormal circumstances. In Russia and Central Europe after the war a currency crisis or flight from the currency was experienced, when no one could be induced to retain holdings either of money or of debts on any terms whatever, and even a high and rising rate of interest was unable to keep pace with the marginal efficiency of capital (especially of stocks of liquid goods) under the influence of the expectation of an ever greater fall in the value of money; whilst in the United States at certain dates in 1932 there was a crisis of the opposite kind — a financial crisis or crisis of liquidation, when scarcely anyone could be induced to part with holdings of money on any reasonable terms. The market monetarists, of course, believe in the effectiveness of QE, although announcing a nominal target would greatly improve a purchase program's effectiveness. This is what Nick Rowe means when he says that there are two types of economists (HT Bob Murphy). There are those who think monetary policy is useless at the zero lower bound, and those who don't. I wonder how much of the divergence between these two traditions has its origins in the data generated by the separate 1932 and 1933 monetary events. If you focused on the latter, you became a monetary policy believer, if you focused on the former you stopped believing. Stephen Williamson (here and here), Bruegel blog, Richard Serlin, Miles Kimball (here and here), Paul Krugman (here and here), James Hamilton, John Taylor, John Cochrane, Michael Woodford (pdf), and Simon Wren Lewis.